One of the best parts of changing up your diet, especially when you're reintroducing carbs, is the variety suddenly available, and with my recent obsession with breakfast, I've been trying all kinds of things. One of my favourite has been a super-healthy breakfast mug cake. Yes, I did just say 'super-healthy breakfast mug cake'. It's true that mug cake ingredients are rarely that great, and the finished product itself leaves a lot to be desired because it's made in a hurry, to the point that I have to wonder what the point is at all, but, when done right, mugs cakes can be a great low-carb, high-protein, high-fibre base to your breakfast. And yes, I know I said 'low-carb', but the trick here is not to leave the cake as is. Toppings! Yes, some cakes like chiffon cakes and Japanese souffle cheese cakes are divine on their own, but otherwise, half of what makes a cake amazing is the contrast of texture from toppings. It's also a wonderful opportunity to add nutrition, as well as making it look good. I came up with a simple and healthy mug cake recipe, which I've been referring to as a 'canvas cake'. Why? Because it's unflavoured, unsweetened and totally white. It's pretty much made for being dressed up, and I've been seriously relishing it. As for topping it, rather than cream or frosting like typical cakes, I use yogurt. Even in my obese teens I discovered the wonder of warm chocolate cakes and cold honey yogurt, and so yogurt was my first choice and one I have yet to deviate from. It's also a source of additional protein, healthy fats and, of course, carbs, which the cake itself lacks. But yogurt doesn't add too many carbs, if even enough for breakfast, which leaves room for more. Like fruit or granola, which adds additional sweetness, fibre and in the latter's case, crunch. 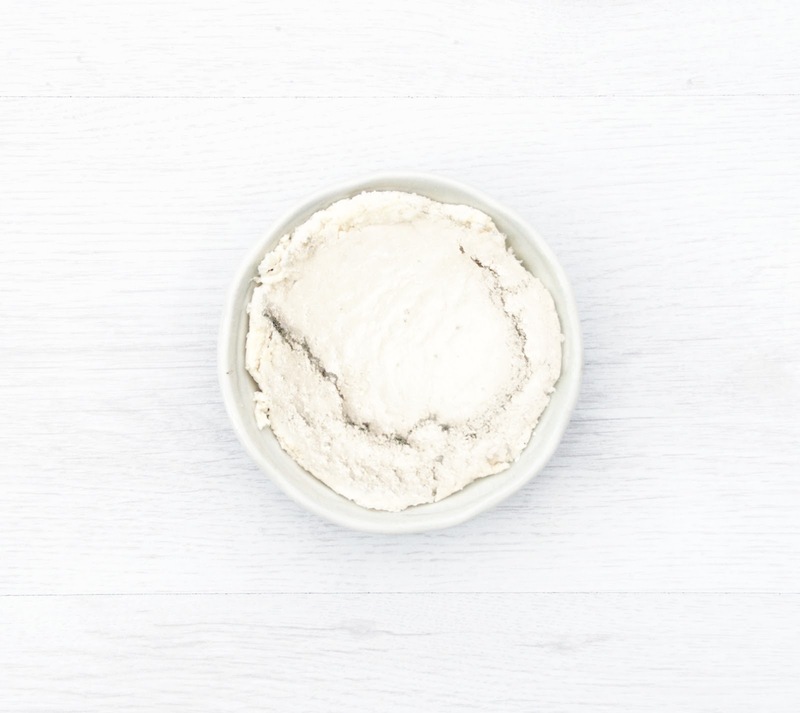 • coconut flour - you need little of it because it's freakishly absorbent, which makes the finished cake low-carb. It's a great source of fibre, with 5g in every 2 tablespoons, and lauric acid, a healthy fat which supports the immune system. • Whey protein, though plant-based protein powder can work, too. • 1 egg white - low-calorie, additional protein and a binder. • water - adds moisture, obviously, and is calorie-free, but milk can be used instead. • baking soda - for lift. Notice anything? All these ingredients are either white or colourless, with the exception of the whey which is off-white. All together, though, it creates a white cake which is rich in protein and fibre, low in carbs and practically absent of sugar. It's also only about 130 calories. The cake itself can be dressed up with flavouring, you could add 1/4 cup of honey, or some chopped fruit, spices, cacao powder and so on. Generally, you only need to add a little, so the base cake is unlikely to exceed 160 calories. The yogurt 'frosting' consists of either Greek yogurt, yogurt with a fruit layer or plain with a teaspoon of honey. I always use bio-live yogurt for the extra probiotics. Generally, 50g is enough, and adds about 45 calories depending on whether or not it's fat-free. Though I admit that I do use the whole 100g pot because the yogurt warms on the cake, and it's nice to pour the rest over half way through for a fresh dose of cold. 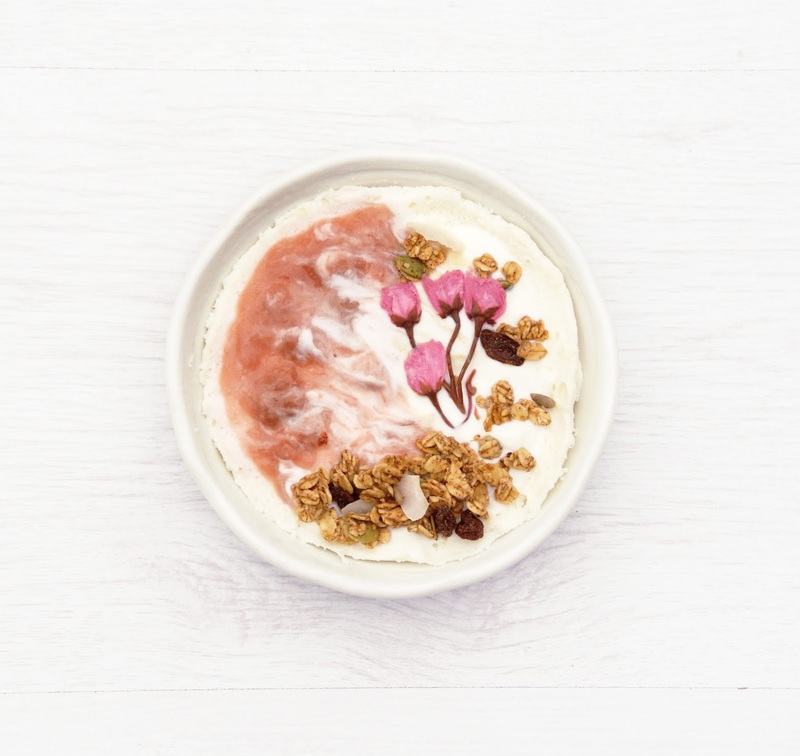 The toppings usually consist of something pretty, and I love a bit of crunch so granola or Graze often make an appearance. Generally 15g is enough, which is also about 1/3 of a Graze protein topper punnet, and that, too, adds about 50 calories. Some small squares of chocolate are also good - 1 row of Green & Black's organic chocolate is perfect. Edible flowers, berries and so on are also winners. 1. Mix dry ingredients (including Stevia, if using) in a microwave-safe mug or bowl. I've been using a bowl, then transferring it when cooked to a slightly smaller and much shallower dish for ease of decorating. 2. Mix fresh egg white with 60ml water. 3. Combine with the dry ingredients and mix until smooth. 4. Add any chopped fruit, puree, syrup, cocoa, matcha etc. 5. Microwave for 2-3x 40 seconds. 6. Cover in yogurt and toppings, then devour.